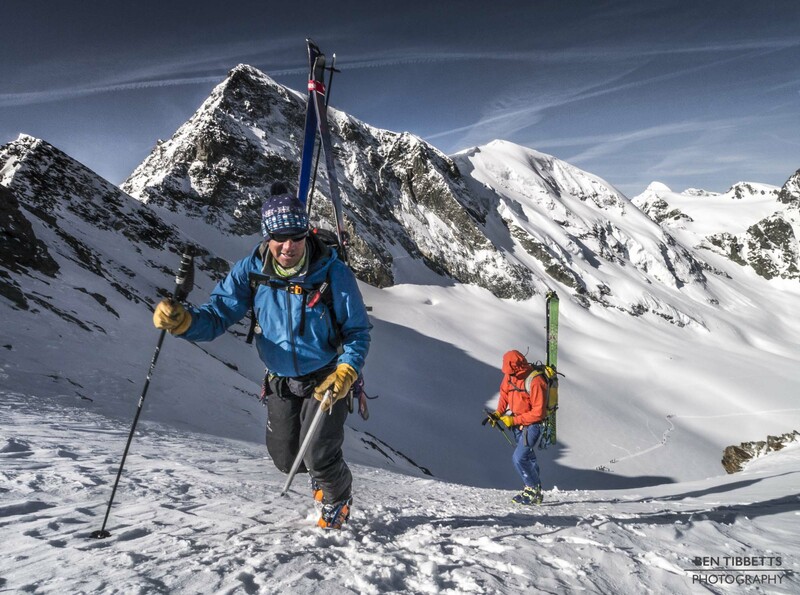 Two weeks ago we had the five days of the British Mountain Guies ski touring training that were run by Terry Ralphs and Graham McMahon, two veteran BMG ski guides. We were based in Arolla in Swiss Valais, but were focussed on hut to hut touring so only spent two nights there. We traversed over to the Dix hut in good weather on the first day, using the Col de Riedmatten to look at short roping ski clients, then practiced crevasse rescue systems in the afternoon. The second day we traversed over the Pigne d’Arolla in deteriorating weather, looking at navigation and roped travel techniques uphill and down. We continued in a whiteout to the Col de l’Evêque and then in brighter spells down to the Nacamuli hut just over the border into Italy. 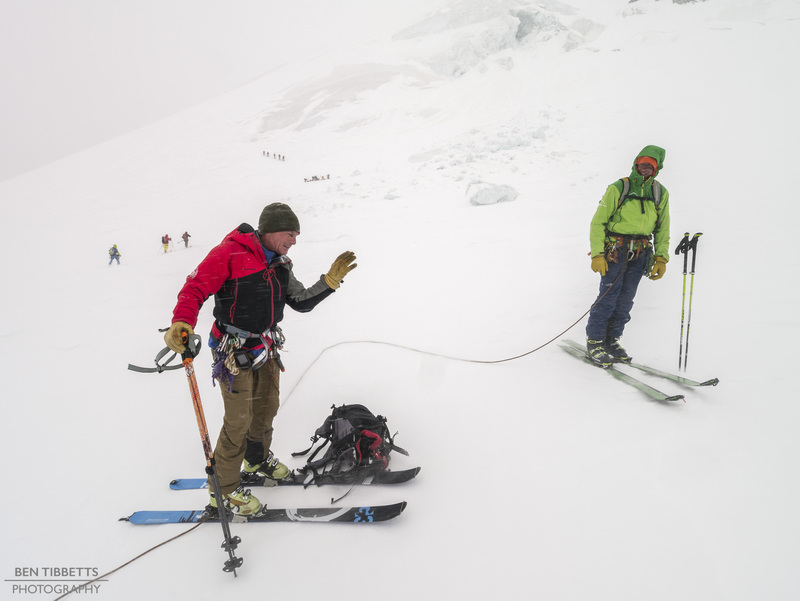 Terry Ralphs and Mark Chadwick in deteriorating weather below the Serpentine of Pigne D’Arolla. Graham McMahon and Mark Chadwick at Col du Mont Brulé. On the third day we traversed the Col du Mont Brulé, looking again at managing clients on steep ground. 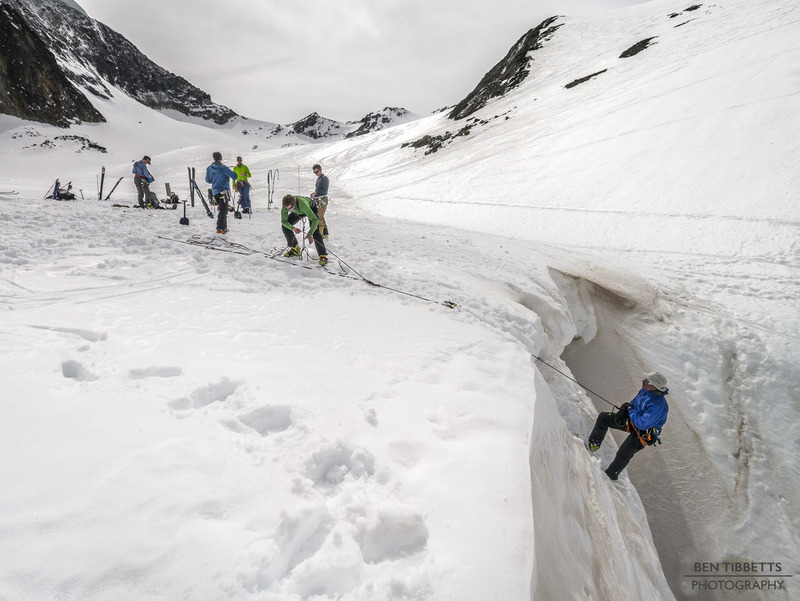 We all decided to boot up with crampons and ice axe, but got a bit of a schooling from a Swiss German guide who cut a skin track up the 40º slope for his clients! We then traveresed to Col Valpelline, round the Tête Blanche and down the left side of the engaging Ferpècle Glacier back to the valley floor. With a bit of bushwhacking we got to the road head above Evolène and back to Arolla for a night. 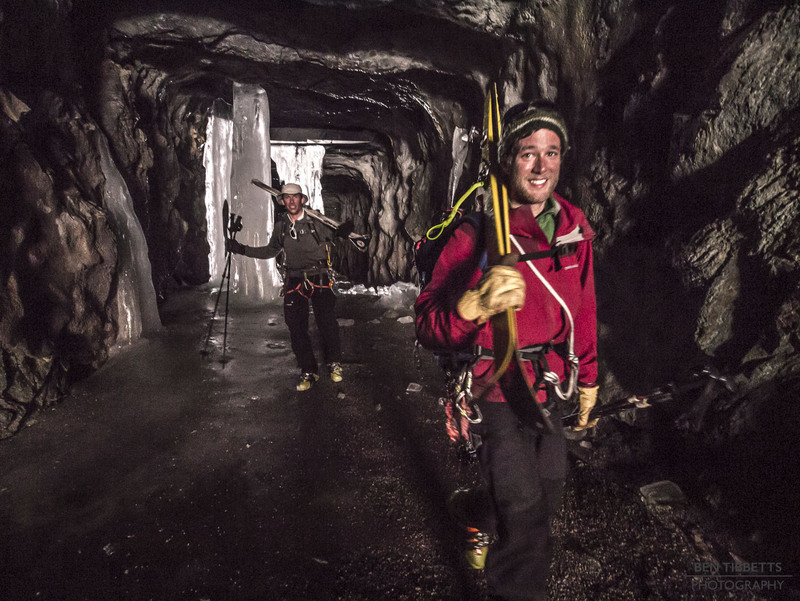 Neil Mackay and Miles Perkin in an icy road tunnel at Ferpècle. Day 4 we set off over La Cassorte, practicing cutting kick turn platforms and spotting clients uphill, and using rope lowering techniques in descent. We descended good snow from the Col des Ignes and traversed up to the Aiguilles Rouges refuge. Terry Ralphs demonstrating cutting kick turn steps with his classic wooden shafted ice tool. Graham McMahon and Kenny Grant at La Cassorte. 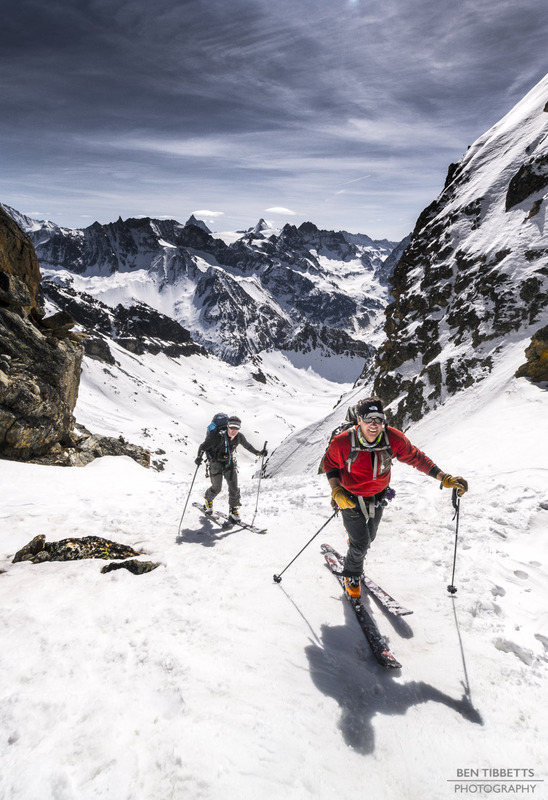 The last day we summited the Vouasson, and descended the Glacier de Vouasson, looking at route choice in steep terrain, and so down to the snow line and some bandit grass skiing back to Evolène. A great week with much learnt about how to guide and safeguard clients on planks. Thanks Terry and Graham!